Muscle growth and maintenance take place during a metabolic process called muscle protein synthesis. Your body is in a constant state of requiring energy, and one way it can meet its energy needs is by consuming the protein in your muscles. Therefore, if you want to maintain or make your muscles larger, the rate of muscle protein synthesis must be greater than the rate of muscle protein breakdown, according to the University of New Mexico. Consuming adequate protein and engaging in strength training can be helpful in fueling muscle protein synthesis. The quality and quantity of muscle tissue you have in your body is constantly degrading. As you age, the breakdown of muscle tissue accelerates. The American College of Sports Medicine states that age-related muscular atrophy varies by individual, and increases or decreases depending on changes in endocrine status and quality of nutrition. Though the rate of muscle loss may be different for every person, registered dietitian Carolyn Nickol of the University of Cincinnati notes that a sedentary lifestyle after the age of 25 leads to muscle mass loss around 3 to 5 percent every 10 years. To counteract the breakdown of muscle tissue, some people engage in a strength training program. When your muscles undergo strength training, the fibers experience trauma and damage. The damage to the muscle fibers activates satellite cells, according to University of New Mexico sports physiologist Len Kravitz, Ph.D. The activation of these cells triggers a metabolic process of cell division and adaptation that can lead to muscle growth if the new cells have adequate nourishment. 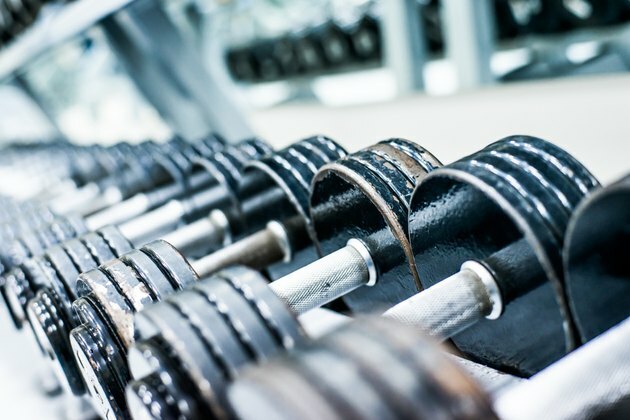 Weight lifting stimulates the metabolic process for muscle growth, but if you do not provide your muscles with the nutrients they need to repair the damage you inflicted, they will remain in a degraded state. The U.S. Department of Agriculture recommends that an adult consume 0.8 g of protein per kilogram of body weight daily. Ideally, this protein should come from low-fat sources that contain all nine essential amino acids, such as lean meat or poultry, eggs and milk. Regularly eating protein will keep amino acids flowing to your muscles for protein synthesis, thus preventing muscle loss. If you wish to grow your muscles, you may need to eat more than the RDA of protein. Speak to a registered dietitian about how much protein you need for your muscle growth or maintenance goals. You may be able to improve upon your muscle growth and maintenance by consuming protein around the time that you lift weights. In a review of protein supplement timing published in 2007 in "Strength and Conditioning Journal," Jay Hoffman, Ph.D. states that some research indicates protein supplementation before you exercise can increase the rate essential muscle growth nutrients are delivered to your muscles by more than two and one-half times their normal rate after exercise. University of New Mexico: How Do Muscles Grow? ; Len Kravitz, Ph.D.
University of Cincinnati: Muscle Loss as We Age; Carolyn Nickol, R.D., M.Ed.